The Texas House Transportation and House International Trade & Intergovernmental Affairs Committees listen to testimony during a joint hearing Tuesday, March 20, 2018, at the Knapp Conference Center in Weslaco. WESLACO — Nearly 20 state representatives gaveled into a joint hearing here Tuesday to learn about the Rio Grande Valley, its international ports of entry and what they, as state legislators, could do to help. 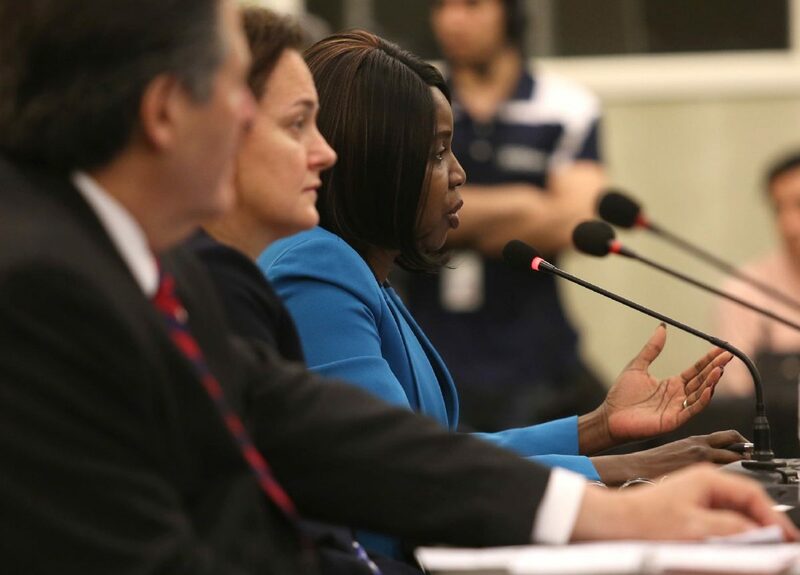 Lawmakers learned about staffing issues at international bridges between Texas and Mexico, inspection problems at those same bridges and the hourly importance of local, state and federal cooperation at the ports. Noting the hearing’s importance, lawmakers said they came away with a better understanding of the region. But whether they will actually be of assistance was in question during the proceeding. 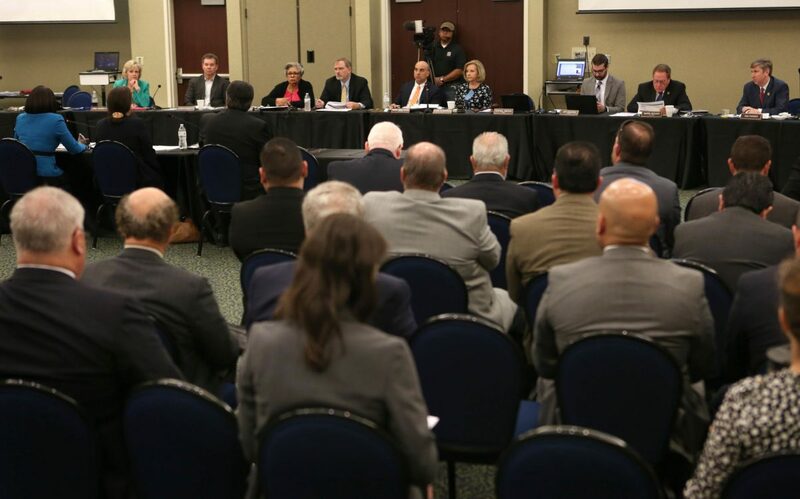 Members of the Texas House International Trade & Intergovernmental Affairs and Transportation Committees received written and verbal testimonies from more than 10 people at Tuesday’s joint hearing at the Knapp Medical Center’s Conference Center in Weslaco. 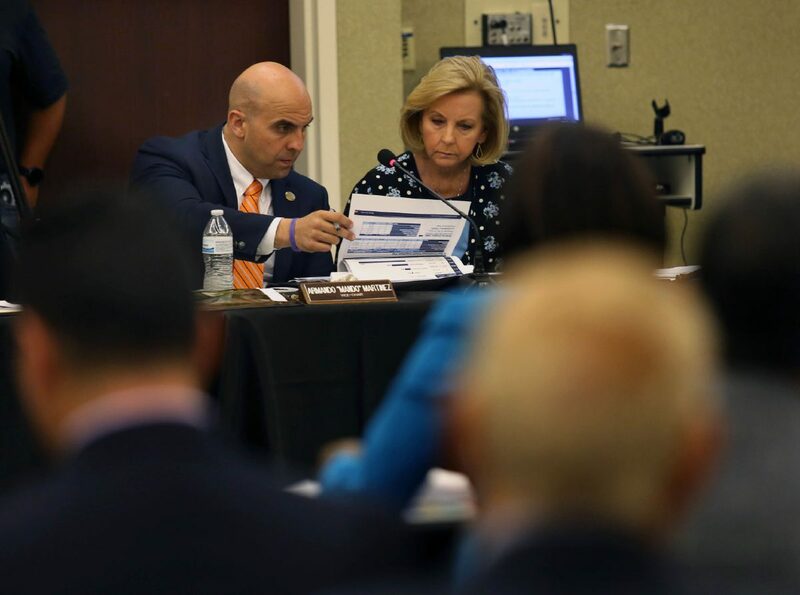 Rep. Armando "Mando" Martinez, vice chair of the Texas House Transportation Committee, left, looks through a presentation with committee Chair Geanie Morrison during a joint hearing with the House International Trade & Intergovernmental Affairs Committee on Tuesday, March 20, 2018, at the Knapp Conference Center in Weslaco. Pharr Mayor Ambrosio Hernandez testifies to the Texas House Transportation and House International Trade & Intergovernmental Affairs Committees during a joint hearing Tuesday, March 20, 2018, at the Knapp Conference Center in Weslaco. Rep. Armando "Mando" Martinez, vice chair of the Texas House Transportation Committee, left, jokes with Cameron County Judge Eddie Treviño Jr., not pictured, as committee chair Geanie Morrison laughs during a joint hearing with the House International Trade & Intergovernmental Affairs Committee Tuesday, March 20, 2018, at the Knapp Conference Center in Weslaco. Caroline Mays, of the Texas Department of Transportation's Freight and International Trade Section, testifies to the Texas House Transportation and House International Trade & Intergovernmental Affairs Committees during a joint hearing Tuesday, March 20, 2018, at the Knapp Conference Center in Weslaco. Rep. Armando "Mando" Martinez, vice chair of the House Transportation Committee, left, talks with House International Trade & Intergovernmental Affairs Committee Chairman Rafael Anchia during a joint hearing Tuesday, March 20, 2018, at the Knapp Conference Center in Weslaco. Cameron County Judge Eddie Treviño Jr. testifies to the House Transportation and House International Trade & Intergovernmental Affairs Committees during a joint hearing Tuesday, March 20, 2018, at the Knapp Conference Center in Weslaco. 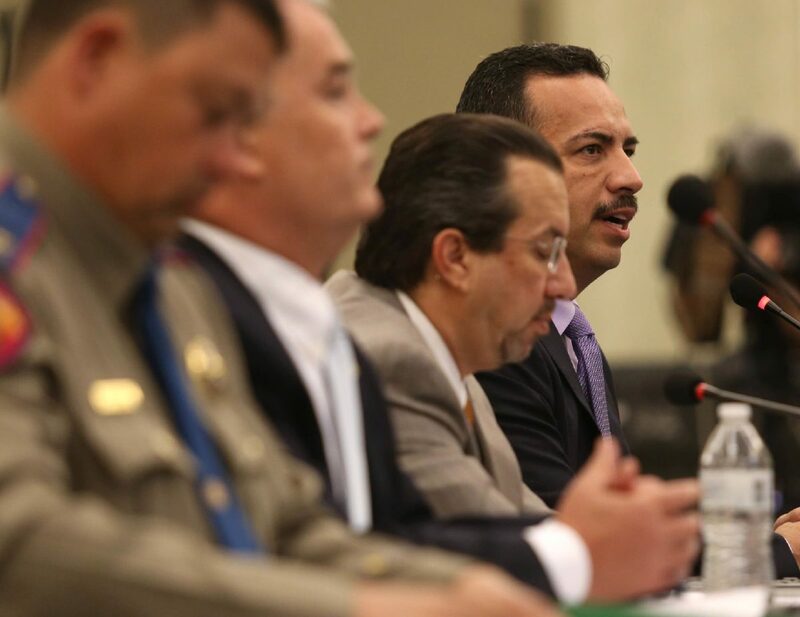 The diverse set of testimonies were submitted by Pharr Mayor Ambrosio Hernandez, Laredo Mayor Pete Saenz, Cameron County Judge Eddie Trevino Jr. and Bradd Skinner, U.S. Customs and Border Protection’s deputy director for field operations out of Laredo, in addition to multiple representatives of state agencies and stakeholders. Interestingly, it was also several lawmakers’ first-ever Valley visit; state Rep. Craig Goldman, R-Fort Worth, being among them. Others, such as Joseph Pickett, D-El Paso, and Armando “Mando” Martinez, D-Weslaco, have spent their entire lives on the border. Transportation Committee Chair Geanie W. Morrison, R-Victoria, said it was the vice chair, Martinez, who was responsible for the hearing in his hometown. The members also toured multiple bridges after the hearing. Martinez said the field hearings are mandated by the speaker of the house, which is why he pushed for one in the Valley. Field hearings happen sporadically, Pickett said, and at various levels. Sen. John Cornyn, R-Texas, held a senate field hearing on the North American Free Trade Agreement in San Antonio last November. 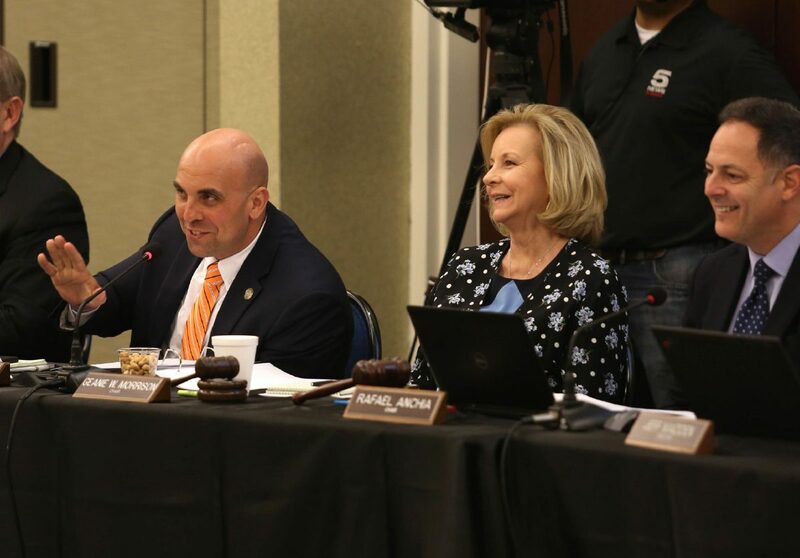 While Tuesday’s panel was mostly full of lawmakers from both committees and the conference center was largely occupied by stakeholders and invested parties, it was tough for some local officials to tell how much the hearing will resonate. After all, multiple testifiers noted how the Valley’s voice can get lost at larger levels of government. 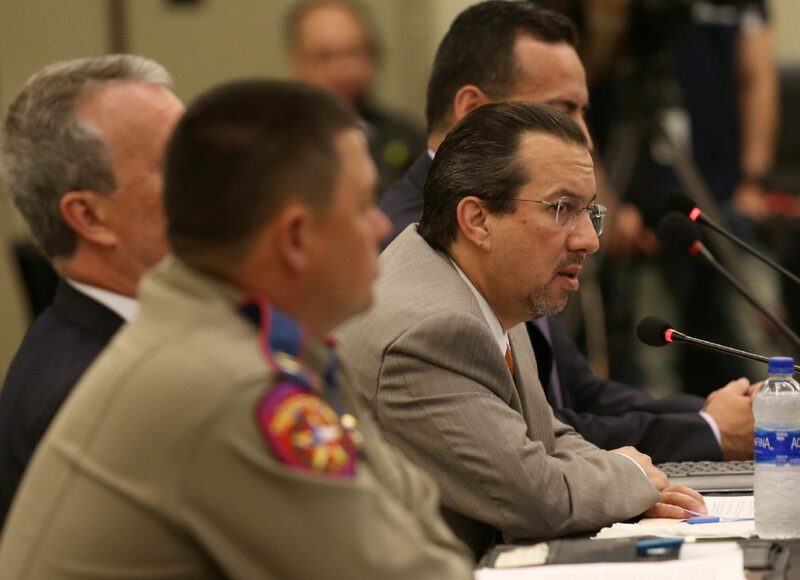 Pickett was simultaneously playful and serious during the hearing, acknowledging afterward that much of the information was not news to him, having represented a border community — El Paso — in the Texas House for 23 years. “Border delays are potentially costing the American economy billions of dollars,” Saenz said. “The joint economic committee of the U.S. Congress finds that border delays cost the U.S. economy between $90 million and $5.8 billion each year. Matt Mandel — chief operating officer at SunFed, the largest importer of squash in the United States — was the sole produce stakeholder to testify. 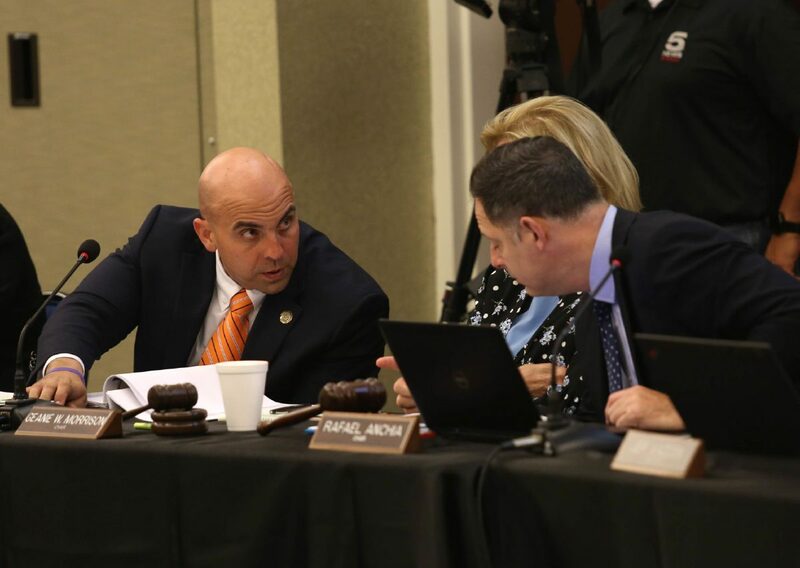 And he seemed to galvanize the group of lawmakers most when explaining why having a combined inspection works better than the current process at Texas ports, which includes various agencies conducting different inspections. “My company being in the business of incredibly perishable goods, we have a whole different set of costs that typically go unnoticed or unmentioned,” Mandel said. “Every minute, and I know it sounds goofy to talk about the perishability of products in terms of minutes, but every minute does count. Every little moment that we can cut out of the supply chain really does help. Four members of the panel grabbed pens to jot notes during this moment of Mandel’s testimony. State Rep. James White, R-Hillister, called Mandel’s testimony and the hearing at large “eye opening,” and acknowledged that “we’ve got a lot of work to do.” Goldman said the hearing, and visit, was especially impactful. Multiple members fancied the dinner on Monday at Arturo’s Bar and Grill, especially those who were new to the Valley. About 30 minutes after the hearing adjourned, state Rep. Senfronia Thompson, D-Houston, ambled alone in the near-empty hall, carrying nothing but her belongings before departing.